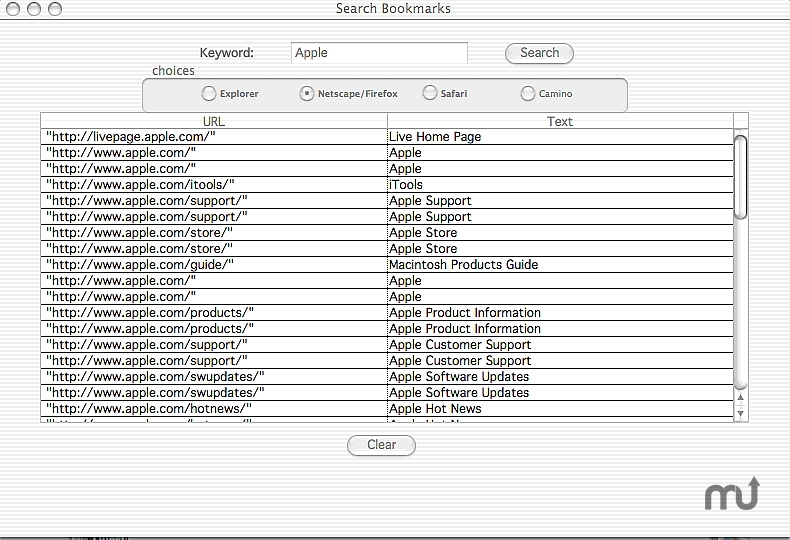 Search all your bookmarks easily. Is there a better alternative to URLParser2? Is URLParser2 really the best app in Browsers category? Will URLParser2 work good on macOS 10.13.4? The operation of this could not be simpler. First choose which browser's bookmarks you want to search... The first time you use it to search it will ask you to find your bookmark file. Instructions are included on how to do this. Version 2.1: Changed the appearance and made the search button into a default button. Corrected a bug that could cause the menu bar to disappear the first time the application was used. URLParser2 needs a rating. Be the first to rate this app and get the discussion started! Depending on which browser you have chosen (FireFox, Internet Explorer, Safari, or Camino) this application will duplicate that in a file called "url.html", "url2.html", "url3.html", or "url4.html" in the folder where it is located and will use them in the future as long as they are there. To update one of the files simply trash it and the next time you will again be asked to locate the bookmark file you wish to use again. You can search all the bookmark files in a single search simply by choosing one browser button after another. To search, enter a keyword and click search. You will get a list of results. Clicking on one of these will take you to that site using your default browser. The search is not case sensitive. The trial version is limited to four hits.